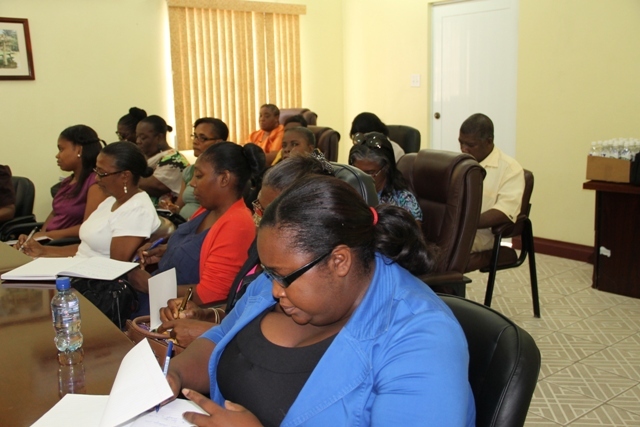 NIA CHARLESTOWN NEVIS (JULY 24, 2015) — Premier of Nevis and Minister of Education in the Nevis Island Administration (NIA) Hon. Vance Amory, commended head teachers on the island for their management of the education system on Nevis, despite challenges they may face. Mr. Amory applauded the head teachers when he met with them on July 21, 2015, to review the recently concluded school year and to discuss plans for the coming school year. 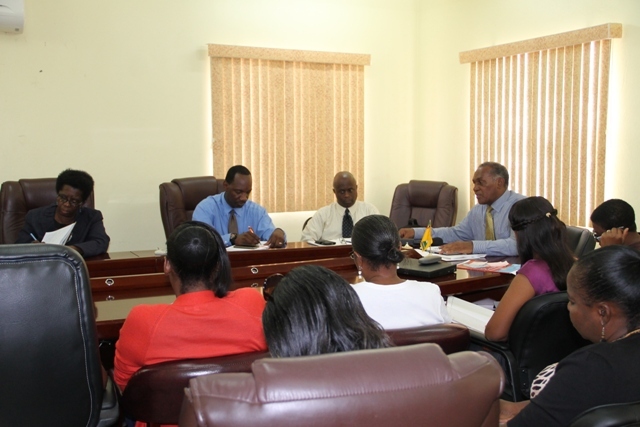 The meeting was held at the Ministry of Finance conference room. He told them that based on the reports he had received, they had done a good job of keeping things under control although everything could not be perfect. “I think you all still strive for that perfection and that excellence to ensure that you manage the education of our children and that you have made the extra effort to control the environment of your schools and to minimise the negative situations with which you would have had to grapple during this last school year,” he said. In relation to the teachers at the schools, Mr. Amory stated that they had also done well. He acknowledged that although things may not have always gone well, the head teachers were also able to manage the instances where there were cases of staff indiscipline. The Minister of Education also used the opportunity to thank the Open University of the West Indies who had provided some training for the heads of schools regarding management and to all the heads who had responded to the call to do the training which he believes would serve them well as they continued to manage the education system on Nevis. Mr. Amory said the Administration would continue to provide and broaden the scope of the training following an evaluation, to include other teachers in various schools who had leadership qualities. “We will get those potential leaders into the training so that we can have a long-term succession plan for the education system in Nevis. “I think it is important that we prepare people over time with the expectation that we have a cadre of potential leaders who can rise to the occasion should there be any need whether unforeseen or calculated,” he said. Also at the meeting were Permanent Secretary in the Ministry of Education Wakely Daniel, Assistant Permanent Secretary Kevin Barrett and Principal Education Officer in the Department of Education Palsy Wilkin.